In 1999, Norwegian authorities designated NORSAR as the National Data Centre (NDC) for Norway for CTBT-related technical matters. Norway’s NDC draws on infrastructure and human resources in NORSAR’s Department of Seismology and Test Ban Monitoring. In cooperation with the technical secretariat of the Preparatory Commission for the Comprehensive Nuclear-Test-Ban Treaty Organization (CTBTO) in Vienna, NORSAR facilitates the establishment of IMS (International Monitoring System) stations on Norwegian territory and provides for their operation and maintenance. NORSAR provides for timely transmission of data from IMS stations on Norwegian territory to the International Data Centre (IDC) in Vienna. 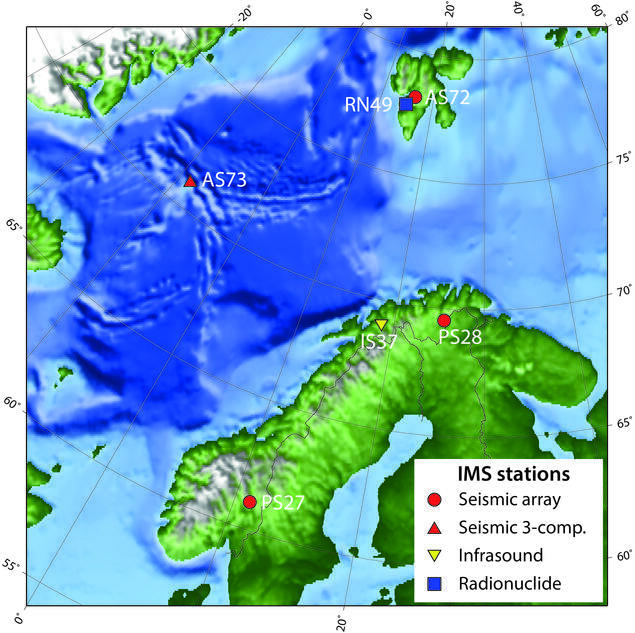 Operating the Norwegian IMS stations (as shown in the map below), including facilities located in harsh arctic environments, represents a considerable challenge to the NDC staff. The key emphasis is on the regularity of data recording and timely transmission of data to the IDC, as well as on data quality and integrity. The NDC employs an internal quality assurance system to ensure that IMS standards for station operations are met. Norway’s NDC regularly receives information from the IDC containing the results of its analysis of data from the IMS. Important in this respect are the daily Reviewed Event Bulletins (REBs), which are listings of seismic events detected and located by the IDC. As a supplement to this information, the Norwegian NDC issues seismic bulletins of its own. One of these is a regional bulletin with emphasis on events in the European Arctic, and this bulletin uses data also from non-IMS stations in the region and contains information on events that are additional to those in the REBs. It is a key function of the Norwegian NDC to perform independent assessments of events of special interest to Norway, and to keep Norwegian authorities informed of such events. In this work, the Norwegian NDC draws heavily on its archive of seismic data, containing digital records of earthquakes, nuclear- and non-nuclear explosions dating back to 1970. NORSAR advises Norwegian authorities on the nature of events detected and located by the IDC. This task is a national matter, as the technical secretariat of the CTBTO is not mandated to pass judgment on the nature of events in relation to Treaty compliance. NORSAR supports Norwegian authorities in technical discussions in meetings of policy making organs of the CTBTO. Since 1997, NORSAR employees have assumed leading roles in organizing the work of the CTBTO’s working group for verification.